If you are like me it is hard to stop fishing as the sun creeps to the horizon even when you know that walking out in the dark will be a bad trip. If I am fishing with someone else, like Feral, it is doubly hard because I know if I fall into a beaver hole and break a leg he’ll get me out or at least can direct someone back to the spot. I imagine he’ll recast some of the better holes on the way out, but eventually someone will come for me. 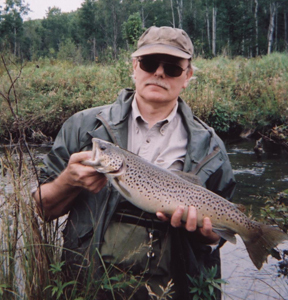 It’s true you can catch big trout during the day, especially in stained or muddy water, but nightfall offers trout free rein of the stream. They stop worrying about Osprey or other predators. They like the cover of darkness and that’s when the larger fish move out to center stream and go on the hunt. I recall a time on the Pigeon, before the fish kill from the Song of the Morning dam, when Feral and I did an evening stretch by walking down stream and fishing back upstream past where we had parked. It was getting dark and we didn’t want to stop even though we knew we would have to walk out through saplings thick as spaghetti growing in a mud bog with beaver holes (near the stream) that were hidden by lush tangled saw grass. The stream itself had beaver dams spanning the stream and places you had to climb out and try to slip back into deep water, then do a wader dance on tip toes to get to solid footing. I hope I painted that picture clear enough – some places aren’t really made for wading, and after dark you need a special mindset called denial. 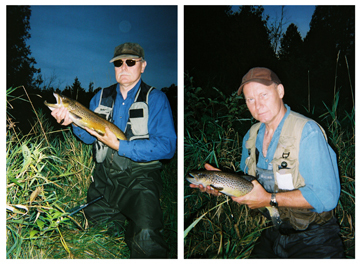 We knew there was a nice bend upstream that held good fish and we were not disappointed. The bend had a straight section leading up to it that had overhanging grass and saplings but was clear and open enough for working good casts right to the bank. From there it veered slowly to the left with the same cover overhanging brush and some various stumps and trash that broke up the stream flow enough to be big trout holding places. When Feral and I fish together we have a system where one guy takes the lead until he gets a fish, or for one or two bends, in which case he is embarrassed enough at not catching anything he reluctantly offers the lead back to the other guy. When the lights go down this unseemly gentleman behavior goes out the window and we scientifically determine who leads by reviewing who has done the best so far and maybe the other guy should get a chance. On this night it didn’t matter who went first because we caught several fish out of the same bend. It happens like that sometimes. The fish cooperate and the fishermen don’t fall in a beaver hole on the way out.